For that horse loving person in your life that already has everything - or is very hard to buy for! Ideal from the 'Leather Therapy' Range - a beautiful packaged Gift Set! 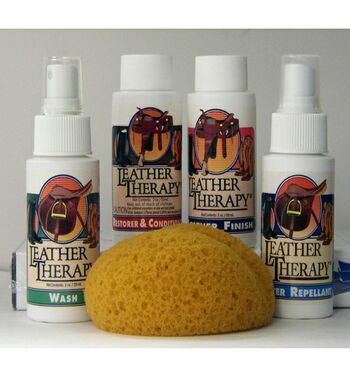 4 x 2oz (59ml) plastic bottles containing Leather Therapy Restorer, Wash, Water Repellent, Finish and a Leather Therapy brochure, topped with a tack sponge presented in a clear vinyl draw string bag. Picture: This product currently does not come in the cylinder as shown. These are fantastic gifts for the horse loving people in your life!